Niger Tornadoes forward, Jonathan Osondu says the team has put the loss to MFM FC behind them and now shifts attention to the Nigeria Professional Football League matchday 9 clash against Enyimba at the Bako Kontagora Stadium, Minna on Wednesday. 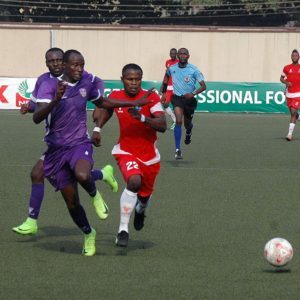 Despite leading MFM by 2-0 at the Agege Stadium in the matchday 8 clash on Sunday, the Minna-based side went ahead to lose 3-2 and Osondu, who scored his team’s second goal in his second match of the season, expressed his disappointment in a chat with Sportinglife.ng. The former Nigeria Under-23 player, who is on loan from Brighter Tomorrow FC said, “We felt very bad for that third goal because the ball was from offside. We had about three penalty calls but the officials denied us. “This is my second match this season because I just recovered from injury. I really felt bad because my intention of coming here is for victory, not to draw or lose. We’ve drawn three matches at home and lost three matches away and we started winning against Sunshine Stars. “Going back home to face Enyimba will be a big game for us. We need to perfect our game plan for the encounter. We are looking forward to the three maximum points,” the former Elkanemi and Katsina United player told Sportinglife.ng.